Bahrain and Saudi Arabia have been linked by a causeway for more than two decades but plans to build a new one are underway at an estimated cost of billions of dollars. The causeway will also include a railway network that will serve as part of the Gulf Cooperation Council’s (GCC) regional railway network project. 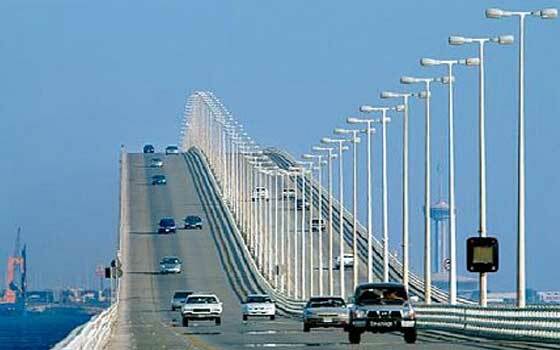 The plan for the new causeway was revealed by King Abdullah of Saudi Arabia last week in a meeting with King Hamad. The causeway will be named after Bahrain’s monarch. Kamal bin Ahmed, Bahrain’s Transport Minister, said the routes of the causeway are “almost finalized” although no date has been chosen yet to begin the project. “We need it to start soon,” as experts from both countries are “still working on other technical issues including financing,” he said. The current causeway that links the two countries was built in 1986. Millions of people use it annually to commute the 25kilometres between the two countries. The Bahrain-Saudi causeway will also be an integral part of GCC railway network that has a global estimated of $20 billion and will cover a distance of 2000 kilometers. However, the GCC regional railway project is expected to be completed in 2017 but it has been faced with several setbacks due to the political differences between the members of the council. Written by: Jaber Ali on September 9, 2014. Posted by Jaber Ali on Sep 9 2014. Filed under Finance, Gulf News, Headlines. You can follow any responses to this entry through the RSS 2.0. Both comments and pings are currently closed.